A Beautiful Ruckus: What a Journey to be Experiencing! What a Journey to be Experiencing! 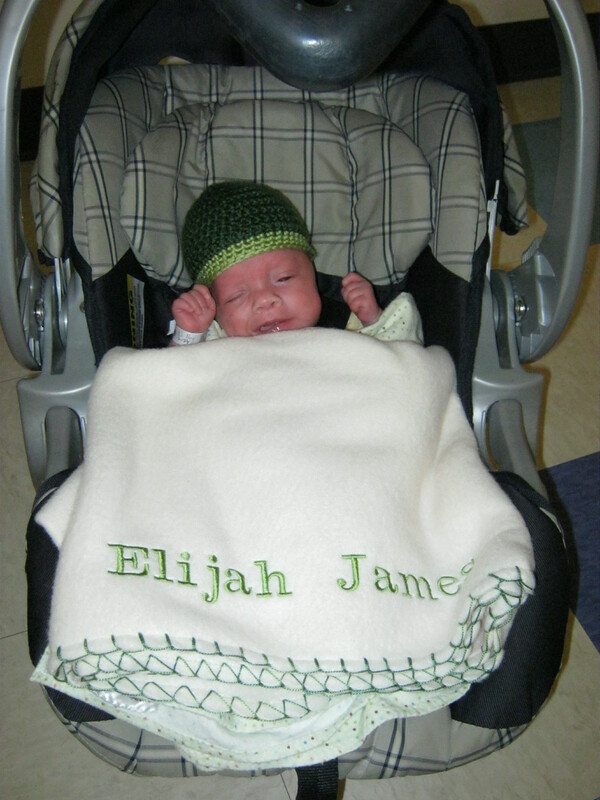 Sean and I went to get Elijah together on Sunday. One of the scariest moments in my entire life was walking down that corridor to go get him. How would they know if we would do a good job when he got home?! Were they really going to let us walk out of there unsupervised without him? Did we watch them enough to be able to do everything for him by ourselves at home? Apparently, they decided we qualified, because they wished us well and wheeled us out the door. Sean, Eli, and I went back two days later and picked up the girls. 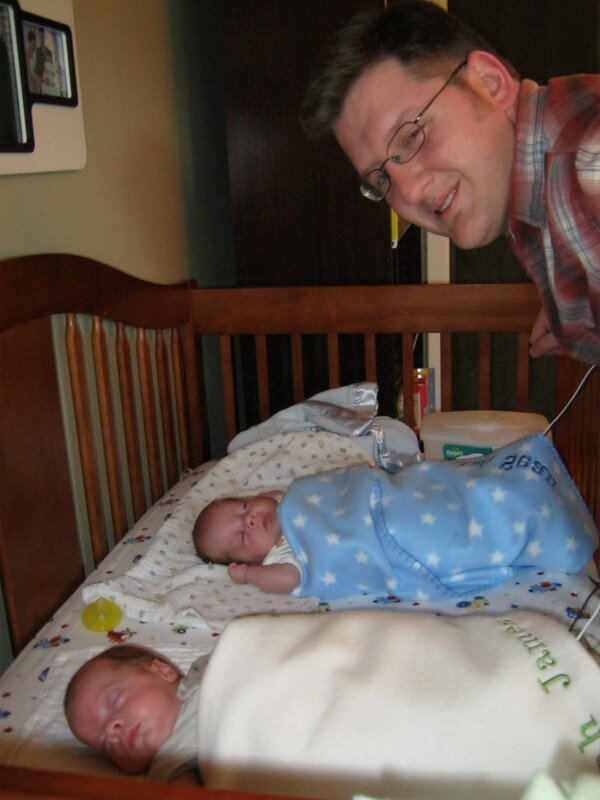 Going from one baby to three is a huge adjustment! And then yesterday, I went back to get Caleb by myself. Sean held down the fort at home with the other three and Aunt Ruby. 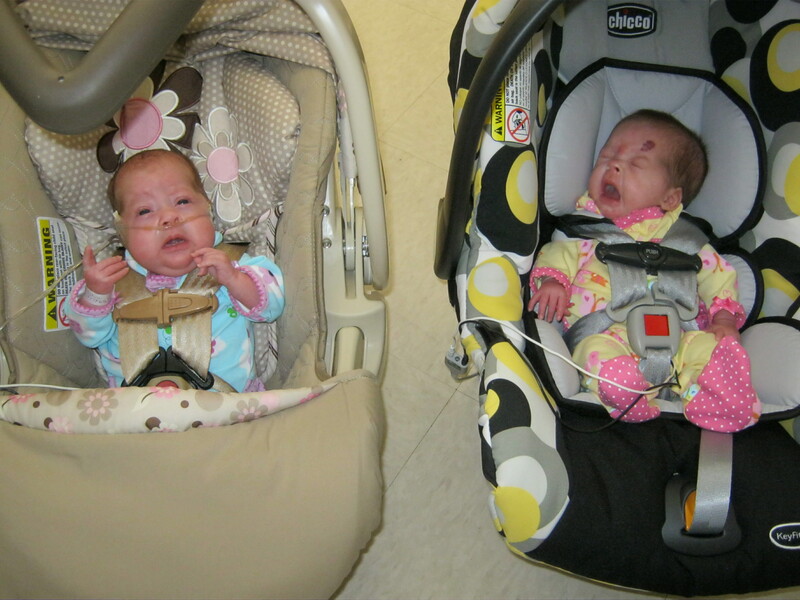 It turns out that going from three infants to four infants is not nearly as jolting as going from one to three. 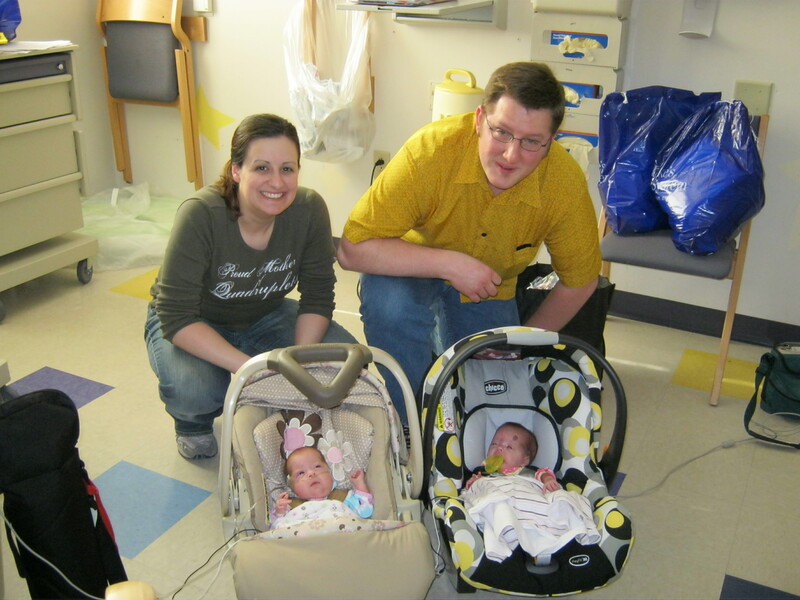 Pictured are Michelle and Martha, two amazing nurses and now friends from the NICU. 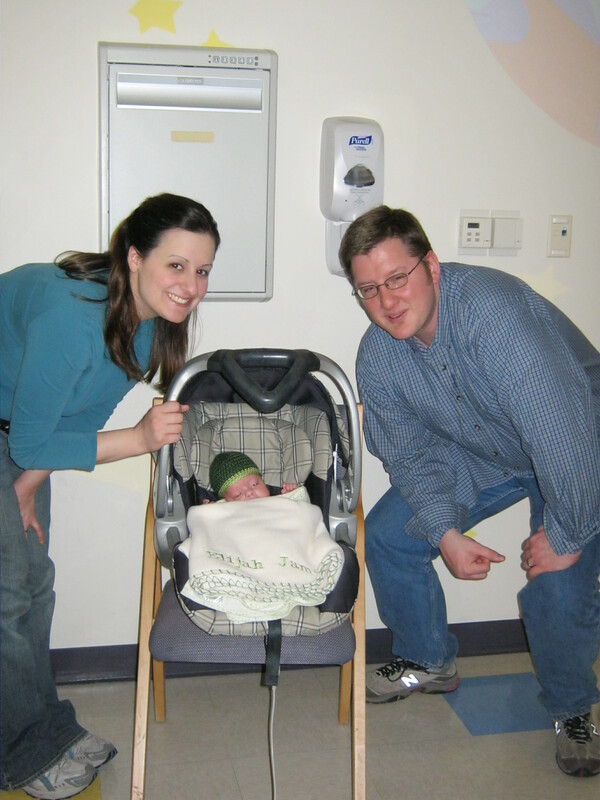 It was so bittersweet to leave the NICU behind. We were ready to put our family back together (and save on gas! ), but we made some wonderful friends with some really fabulous nurses. I would list them all but I’m sure to miss someone and just don’t want to take the risk. 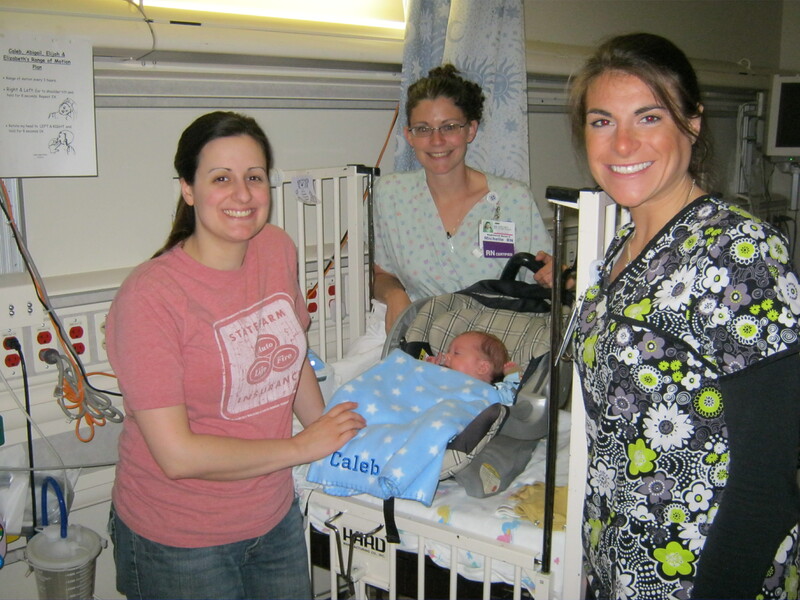 If you are a Saint Luke’s NICU nurse, nurse practitioner, doctor, or respiratory therapist and read this, please know that you have really touched our lives and are so special to us! I was literally choking back tears as I left the hospital last night. We hope some of you will come visit us at some point! Now a few shots of life at the Ishum Home! 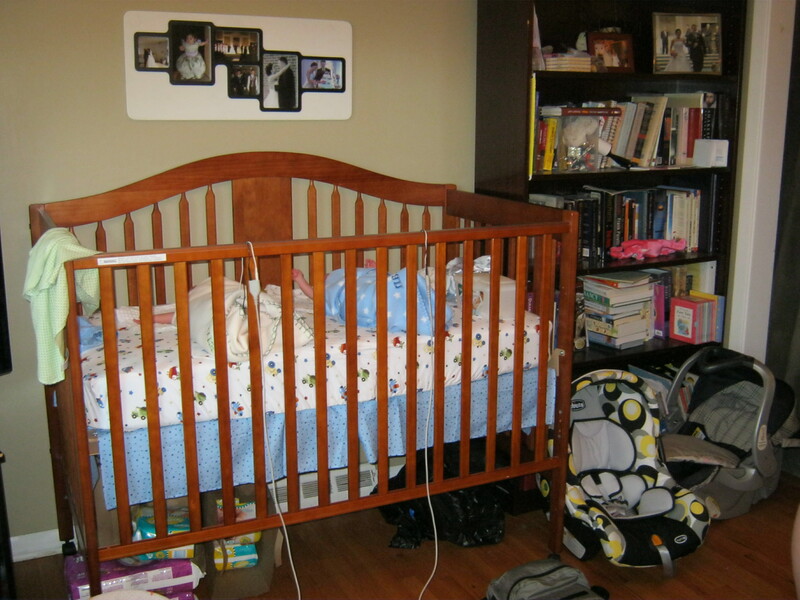 We moved two of our cribs to our living room temporarily until the babies come off of their monitors and oxygen. So we are having our first family campouts right now! 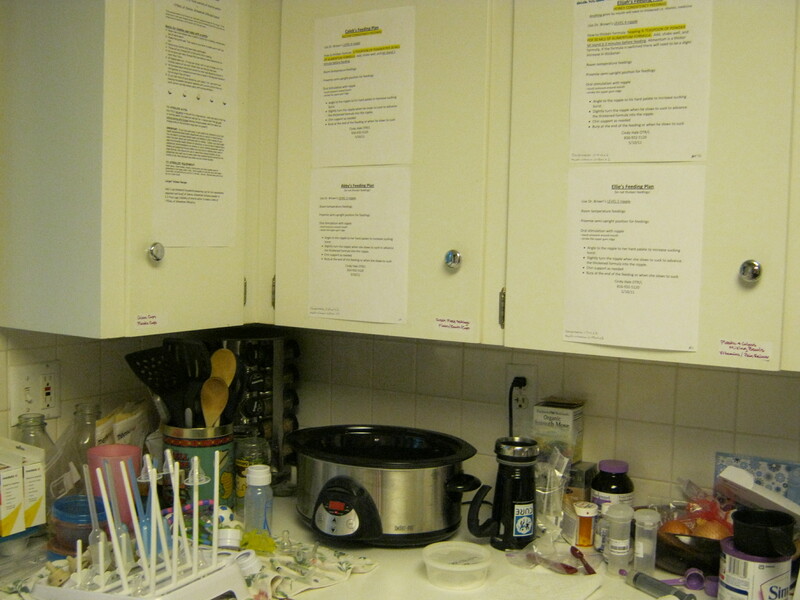 Our kitchen set up: Feeding plans and formula directions posted on the cabinets, bottle supplies and thickener on the counter, and a crockpot to heat four bottles up at once! We are so grateful to those of you who are helping us with meals and baby care! 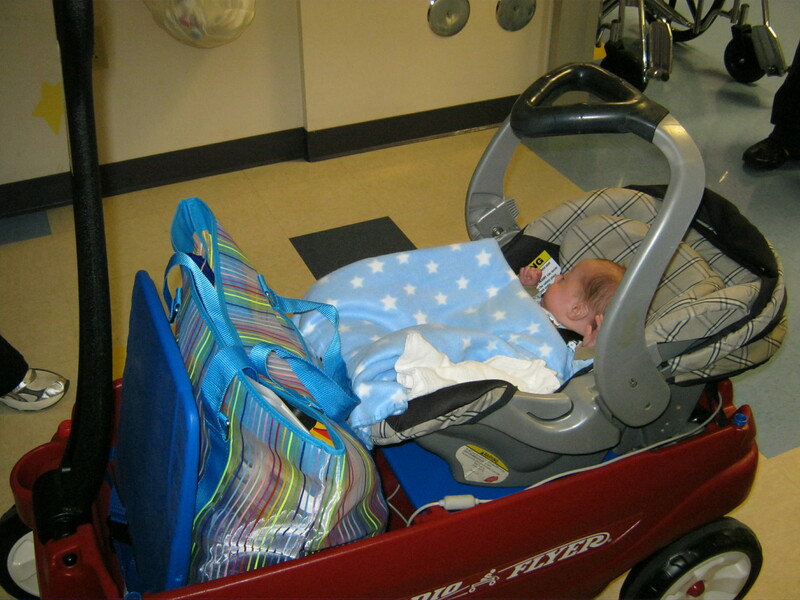 This is an incredibly heavy load for us, even while we are so in love with our kids. Thank you for helping us carry our load for awhile until we find our feet. We've also received emails from some of you who wish you could help, but aren't in a place in life where that can happen right now. We'd like to thank you also for wanting to help us, praying for us, and encouraging us through your emails and comments on the blog. They say it takes a villiage to raise a child. Thanks to all of you for being the villiage to help us raise our children. We can't wait to tell them all about the people who have loved them from before they were even born! We have every intention of keeping our blog going with pictures and stories of the kids. It might be a little slow here for a couple of weeks until we get our routine down, but we appreciate the prayers that are continuing to be sent our way and the love that is being poured out on our little family from across the United States and even in some foreign countries. What a journey to be experiencing! I look at my kids and can hardly believe that they are finally home! I must admit some tears of happiness when I read that you have them all at home now. You all are still in my prayers & since I'm in Califonia that's the only way I can help but rest assured that I will still be praying for you as you begin this arduous journey of raising these 4 blessings from God. Alyssa is in town for the summer and would love to help you. She has been getting alot of practice with our newborn nephew here in Texas and also has lots of time on her hands. Call her and she will gladly help you guys. I just wanted to let you know that I started following your blog when you first found out you were expecting quads, and in the meantime have moved halfway around the world to Australia. My children (ages 8 and under) have been praying for your children almost daily since they were born. They were so excited to hear that they are all home now! God is good! 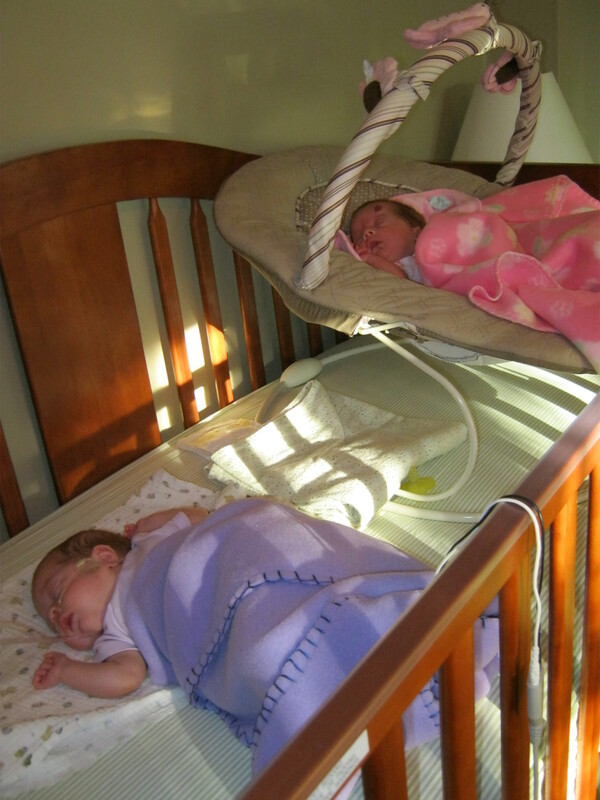 I am so happy and elated with joy that all the babies are home. All of you will settle into a routine and you will love it. Remember routine is the best for everyone. I can't wait to continue you the journey with you guys via blog. Amira and I would love to help but until the babies are well and healthy we will watch from afar. Please do holler if you need something quickly since we are just around the corner. I will be more than happy to drop something off if you need it. Love Always Crystal and Amira. What a beautiful family you have and they are now at home with you. I am one of those who, at my age, don't feel confident in myself to be one of your care givers, but I plan to provide some meals for you soon. I will sign up on the calendar. Thanks so much for keeping us up to date on your blog. I love seeing the pictures!! You look so happy with your sweet family. I'm praying for you and your precious little ones. So happy they're all home! Congratulations! We are so happy for you. Sounds like you all are doing a wonderful job at caring for those little ones. How blessed they are to have parents like you! We are praying for you. wow! i can't even imagine making it through one day but know that God has blessed you with these 4 precious little ones and will equip you to parent them! Praying for your sweet family! I am so happy your little blessings are all home! What an amazing journey it has been for you. I know it must be an incredibly busy time for you right now, and I will be praying for your family as you adjust to taking care of all 4. I'm glad you have the help you need. Congratulations on having them all home. I know it's exhausting and hard to believe, but this time will fly by. Snuggle them as much as you can and let the unimportant stuff go as much as possible. It's well worth it in the end. Good luck!! I saw this and thought of you. I am not sure if this is the product you are using and you may have heard about this already, but thought I would share.